Watkins Glen, NY is known worldwide for its racing track. Watkins Glen International (once called Watkins Glen Grand Prix Circuit) has hosted nearly every class of car racing for more than 50 years, including NASCAR and IndyCar. On July 28, 1973, the Upstate NY speedway hosted the largest music festival to date: Summer Jam. 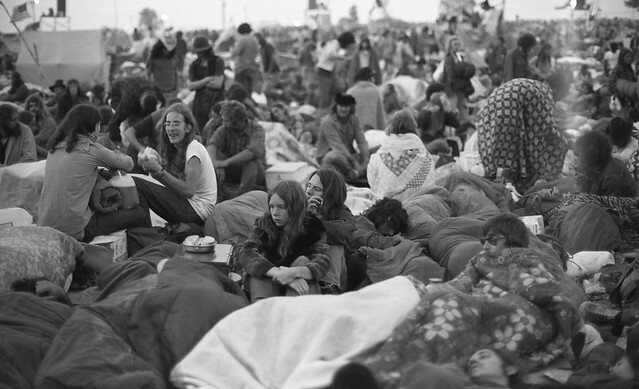 An estimated 600,000 people attended the one-day event to see The Allman Brothers Band, The Band, and The Grateful Dead. With a bigger audience than Woodstock, Summer Jam also had its obstacles. A huge traffic jam made it difficult for many who tried to make it to the concert site, and the area’s country roads prompted many fans to abandon vehicles and walk several miles. At a cost of $10 each, 150,000 tickets were sold, but everyone else got in free. And, also like Woodstock, a good many were not even able to see the stage. Fortunately, 12 huge sound amplifiers were installed so most everyone could at least hear the music. Thousands of fans arrived the day before, and were lucky to hear the bands run soundchecks. The Grateful Dead’s check ran two full sets – giving early birds quite a treat. 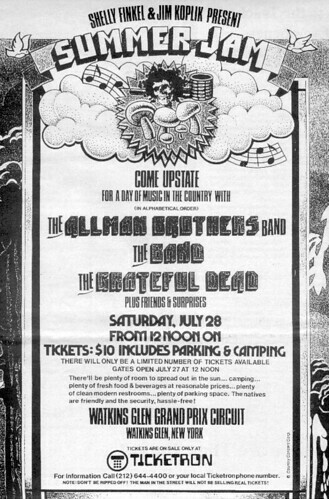 Saturday called for The Grateful Dead to perform first, followed by The Band, then The Allman Brothers Band. The concert wrapped with an hour-long encore jam featuring musicians from all three of the headliners. Broadcasting as CFR AM and CFR FM, a pirate radio station out of Hartford, CT operated from the concert site. It is reported that 10 people were involved, giving live DJ coverage, under the guise of being a Candian station doing a remote broadcast of the concert. In exchange for food, the station even relayed New York State Police announcements about traffic congestion. The station continued broadcasting for some time after the concert to entertain those departing. Were you one of the half-million+ who attended Summer Jam in ’73? We’d love to hear your stories and see your pics!